Flickr user mmmm, brains aka blogger mmmm, brains is entering this cake into a contest. If I were a judge, she’d sure have my vote. This cake looks so intense. Even the brownie bottom has peanut butter chips in it! I’m reposting the recipe because I can’t link directly to it on her blog, but this is the page it came from, you just have to scroll for it. 1. Heat oven to 350°F. Grease 9-inch springform pan with butter. 2. Stir together butter, sugar and vanilla in large bowl with spoon or wire whisk. Add eggs; stir until well blended. Stir in flour, cocoa, baking powder and salt; blend well. Spread in prepared pan. 3. Bake 25 to 30 minutes or until brownie begins to pull away from side of pan. Meanwhile make cheesecake layer (see below). 4. Immediately after removing brownie from oven, sprinkle milk chocolate chips, peanut butter chips and peanut butter cups over brownie surface. Spoon cheesecake mixture over chips. Turn down oven 325°. 5. Beat cream cheese in bowl of electric mixer until smooth. 7. Add sugar, peanut butter and cream; mix until smooth. 9. Pour filling into prepared crust. 10. Double-wrap springform pan with aluminum foil to prevent water seeping in. 11. Place springform pan into a larger baking pan. 12. Pour hot water into the larger pan so that the water comes 1 inch up the sides of the springform pan. 13. Bake at 325 degrees 1-1/2 hours, or until firm and lightly browned. 14. Remove from the oven and allow to cool on a wire rack for one hour. 15. Run a knife along the edge of the cake to loosen it from the pan somewhat. 16. Refrigerate for at least 4 hours before decorating. I tend to make cheesecakes a day ahead to let things set. Cheesecake tip: to get the cake off the bottom of the springform pan, because most crusts have butter in them, you just need to heat up the bottom of the pan a bit and the cake should come off easily. I remove the sides, then hold the pan over a burner on my stove – set to LOW – for about 15 or so seconds. Whatever you can handle. Then run a long cake spatula under the cake and it should slip easily off the pan. Just be careful – the bottom of the cake is now very slippery. 17. Remove cake from pan and put on a pretty plate. 18. Bring whipping cream to boil in a small saucepan. 19. Remove from heat and add semi-sweet and peanut butter chips. Stir, stir, stir until melted and smooth. 20. 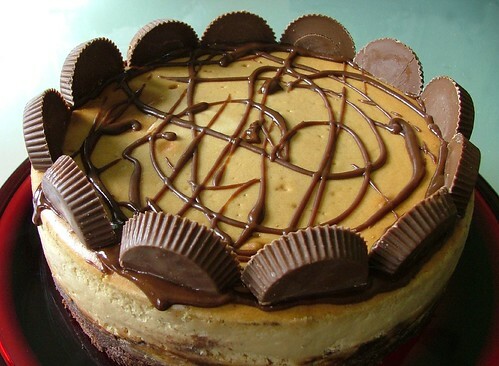 Drizzle over cake and then add peanut butter cup halves around the edge of the cake. My daughter and I made this yesterday, it was DELICIOUS!